Give Me Wings | Retired Ponies Figurines | One Price Low Flat Shipping! From the Trail of Painted Ponies Collection, Give Me Wings. Designed by artist, Kathy Marrow. Made of ceramic.Measures 6" tall. 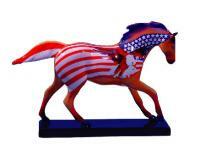 Many of the Painted Ponies carry messages or themes, and this is one for our time. It was inspired by a poem Kathy wrote after the events of September 11: "I will not forget those who sacrificed on the altar of freedom. Precious freedom, give me wings to soar beyond my dreams and touch the stars." As a child of the Southwest, the artist was raised on the San Carlos Apache Reservation and Pine Ridge Sioux Reservation, where her father trained.